Forty years ago a derby-winning salmon or lake trout was almost certainly a plug-caught fish. More and more anglers today are switching to J-Plugs® because, as in the past, plugs are known to produce more and larger fish on a regular basis. Today's J-Plug® is even better-built and more effective than its predecessors as it's made of super-strong materials and designed for maximum action and strength. Another big difference is the availability of special J-Plug® finishes designed specifically for deep water trolling and low light conditions such as the special "Glo" patterns which pick up surface light and give it off down deep. There is a special J-Plug® finish available today which will fit any fishing situation, whether you're after salmon, lake trout, stripers, brown trout or other large game fish. J-Plugs® are fast-action, darting plugs ideally suited for trolling. They are effective because they project a basic minnow image in the water which all fish relate to in all water conditions. This is a basic, wounded minnow, fast darting action which comes from a combination of special swivel chain rigging and lure head chamber design. The precisely engineered tolerance between the rigging and head chamber allows the swivel chain to shift and reposition itself within the chamber. This constantly changes the plug's attitude and direction in the water and creates its fish-catching, erratic, darting action. The swivel chain rigging also allows a direct rod to fish connection after the strike as the plug body will slide up the line, free of the chain and hook assembly and away from the fish. This eliminates head-shaking leverage against the plug body that causes many fish hooked with solid body-to-hook plugs to break free. Because the J-Plug® is buoyant and separates from the hook assembly, it will float to the surface where it can be retrieved in the case of a line break or bottom snag. 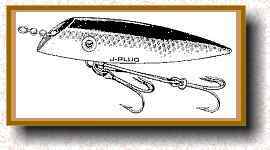 The J-Plug® is a trolling lure and can be fished successfully with a variety of techniques. Trolling is a most effective fishing method, particularly on big waters, as you can cover the greatest amount of water in the shortest time allowing you to locate concentrations of fish quickly and easily. Following are recommended J-Plug® trolling techniques. With the surface or flatline technique, the plug is tied directly to 12- to 20-lb. test main line. No additional weights are used or, at most, a small 1/8- to 1/2-oz. keel-type sinker six feet up the line from the plug. The lure is let out behind your moving boat 50 to 100 feet (anglers fishing for lake trout or brown trout sometimes let out as much as 200 feet of line as these fish can be very skittish of the boat wake) and the troll started. This technique is effective when stripers, lake trout, salmon or brown trout are feeding near the schools of baitfish close to the top or when there is an obvious abundance of other surface activity. With the addition of a standard keel sinker four to six feet up the line from the J-Plug®, shallow to medium depths can be trolled effectively. Sinker weights, depending on the depth desired, for this kind of trolling usually run from 1 to 8 ounces with main line testing from 12 to 30 pounds. Note: Always attach a swivel chain-rigged keel sinker with the single swivel end knotted to your main line and the swivel chain end back to the plug. As in flatlining, let out 50 to 100 feet of line behind your moving boat and begin the troll. One effective way to get a plug deep without excessive lead weights, or if you don't have a downrigger, is with a diving sinker such as the Deep Six®, Pink Lady® or directional Dipsy Diver®. Standard rigging is with 4 to 6 feet of leader between plug and diver and 20- to 30-lb. test main line to your rod. Set the diver to diving position, or in the case of the directional Dipsy® set both the depth and side angle desired, let out 50 to 100 feet of line behind your moving boat (slowly to ensure that no tangles occur) and begin the troll. J-Plugs® often are fished off a downrigger, by themselves (the most popular way). With a downrigger you will be able to work all depths and will have the advantage of no weights between you and the fish once hooked. Anglers who troll J-Plugs® by themselves behind a downrigger often prefer 10 to 20 feet (some as much as 40 feet) between the line release and plug. The longer lengths add to the erratic, darting action of the plug. Dodgers can be used as attractors in conjunction with a #3 J-Plug® behind a downrigger with good results. Size 0 or Size 1 Jensen Dodgers are recommended. Be sure to allow at least six feet of line between the dodger and downrigger line release so as not to inhibit the dodger's action. Allow 20 to 30 inches of leader between your plug and dodger (shorter leaders impart faster plug action and longer leaders slower action). Larger fish do prefer large plugs. Big fish will spend the least amount of energy necessary to catch a meal . . . larger baitfish mean less energy expended to fill up. So, if you're after big salmon or lake trout, use the larger J-Plugs®. But, remember that smaller fish often will not attack a large plug so the use of larger plugs, although great for big fish, may prevent you from catching smaller ones. Standard J-Plugs® are popular because they are especially effective in deep water trolling situations, although, as indicated, they may be successfully used in medium or shallow water as well. The J-Plug® features a basic minnow design with a darting, erratic, free-swimming action which all fish relate to. These plugs are easy to fish, require no tuning and the direct hook-to-rod connection prevents fish from obtaining leverage against the plug, resulting in more landed fish per number of strikes. J-Plugs® also come in a variety of sizes and finishes (rattle models are available) to fit every fishing situation and are versatile as they can be trolled either fast or slow, depending on the fish species you're after. Some other features and additional tips on fishing and using J-Plugs® include: Keep them either in the water or in your tackle box. Extreme heat can deform a plug's shape and direct sunlight can cause the finish to fade. Before placing your plug in the water, check the swivel chain dacron harness for wear and to ensure the knot is cinched tight. 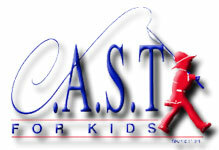 If the harness need replacing you may obtain one from a dealer. The dacron harness is 80-lb. test doubled. The hooks that come with the harness are high quality, 4X strong and plated to resist corrosion. One of the big reasons today's J-Plugs® are effective is because of the wide variety of finishes and colors available . . . one to fit every angling situation. Following is a rundown on a few of the more popular finishes and what each represents and accomplishes in the water. METALLIC: Highly reflective metallic finishes match the flash and colors of baitfish. Silver, Silver Cut Plug and Silver/Blue Top feature the reflective look of baitfish. GLO: J-Plugs® are offered in Glo/Blue Top Ladderback and Glo/Florescent Green Top Ladderback finishes. These are designed specifically for deep water trolling because they contain phosphor pigments that give off light down deep. Note that these finishes contain light-sensitive pigments that can be burned and which will turn gray if exposed to strong, direct sunlight. It's best to keep plugs painted with Glo finishes either in the water fishing or stored away in your tackle box so overexposure doesn't occur. For a quick and easy "glo charge" try Luhr-Jensen's handy Power Flash unit which can double as a camera flash attachment. SPARKLE: Several new sparkle extra-attractive sparkle finishes are now available on J-Plugs®. These include Sparkle Chartreuse/Fire Tiger, Sparkle Chartreuse/Green Tiger, Sparkle Mother-Of-Pearl and Sparkle Fire Tiger. These highly-reflective finishes provide additional strike-enticing action. • Trolling a straight line between two points is the least successful path you can take, once fish have been located in an area. By trolling in zig-zag patterns or in "S" curves, you will impart regular changes in depth and speed to a trolled plug, creating the impression of a wounded, in trouble baitfish which fish will view as an easy meal. • Vary your speed. While slow is the password, this does not mean slow all the time. A lure running through the water at a constant speed, at a constant depth and giving off the same vibration pattern will not catch many fish . . . there's just nothing there to indicate an easy meal is available or that something is in trouble. Slowly, yes, but adjust your speed every few minutes to change the lure's speed and vibration pattern. • Troll Slowly. Big fish will not expend any more energy than necessary to catch a meal. Also, most lures will not perform correctly at fast speeds. The best advice is to troll slowly — the slower the better. • Use a solid knot for connecting your plug to your line or leader such as the improved clinch (see illustration on page 2) and always use a premium quality monofilament line such as Trilene XT which has superior knot strength, small diameter in relation to pound test and is abrasion resistant. • Purchase a quality depth sounder such as one of the Bottomline units which will help in locating fish as well as prime underwater fishing structure which can't otherwise be seen. • Undoubtedly one of the easiest and least complicated things you can do to improve your fishing results is to make sure all hook points are sticky sharp. The majority of lost fish can probably be traced to dull hooks which prevent proper penetration into the fish's mouth. A small file, such as the Sharp Hook File is the absolute best tool available for sharpening fish hooks. Hold the file parallel to the hook point and, with gently one-way strokes, remove a small amount of metal from at least two sides of the point to obtain both a super-sharp point and a knife-like cutting edge. • Keep your plugs above fish as they can't easily see downward. On sunny days fish will be deeper as their eyes are sensitive to strong, direct sunlight. • When trolling plugs in salt water you'll find the optimum feeding and fish-catching times during low light periods and from an hour before, during and an hour after a tide change. Fish areas where birds are working on baitfish schools and troll the clean side of rips. • In fresh water such as in the Great Lakes, the time of day isn't nearly as critical as the depth and the location of the preferred temperature level for the fish species you're seeking . . . the thermocline. Lakes stratify into three separate layers of water in the spring and stay that way until cold weather hits in the fall. The middle layer of water, where there is a large concentration of dissolved oxygen, baitfish and therefore predator fish, is called the thermocline and can generally be found from 10 to 80 feet down. • The peak feeding and optimum temperature for coho and Chinook is 54° with an active range from 54° to 54° For lake trout the peak feeding and optimum temperature is 54° with activity from 54° to 54° Fish will rarely venture out of these zones once stratification has taken place, except to catch a meal and then will quickly return to it. One thing to remember when fishing temperatures layers such as the thermocline is that it can change from day to day in terms of depth because of wind and/or wave action. It may be several feet deeper or shallower one day from the next so you'll have to locate it each and every time you go out. Those are several of the tips and techniques which will help you successfully fish J-Plugs® in your favorite waters and for your favorite fish species. Remember to experiment, troll zig-zag patterns or otherwise constantly change the plug's action, Keep hooks sticky sharp and go prepared with a variety of finishes and sizes . . . there's a J-Plug® for every fishing situation.